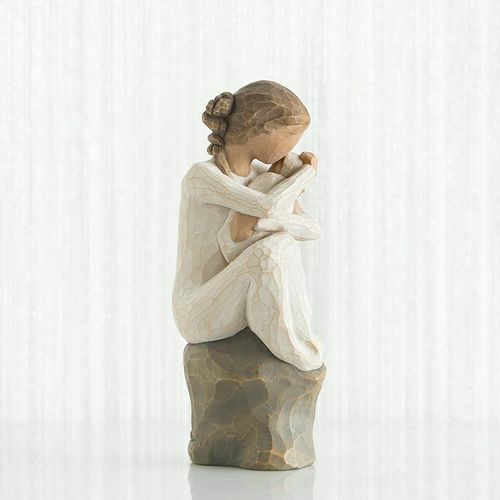 Message on the card inside reads: "Love and protect thee, forever"
The Willow Tree Guardian represents the overwhelming feelings of motherhood, and the desire to protect your new baby forever. The image of an infant cradled closely in her mothers arms is a symbol of the tremendous love that a mother experiences when holding her new child. This figurine could suggest a guardian spirit of protection. 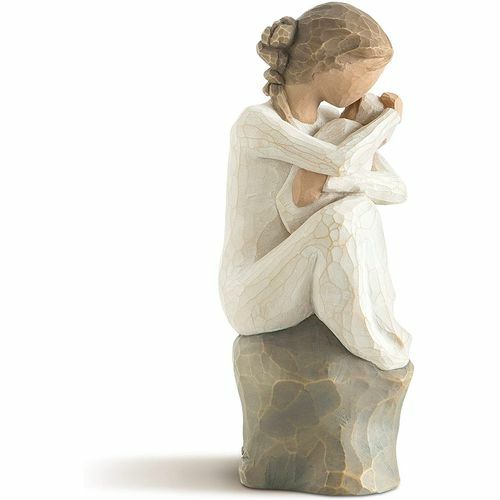 She could also be comforting to someone who has lost a child; a reminder of the love and caring a mother always feels, regardless of where her child is. The word thee is used in the sentiment as an intimate way of talking to an infant, Susan Lordi says that she feels the word has a poetic sound and shows reverence and tenderness. Its the sort of word reserved for someone you love.